In this study of democratisation, Joshua Kurlantzick proposes that the spate of retreating democracies, one after another over the past two decades, is not just a series of exceptions, but instead reflects democracy in worldwide decline. Muireann O’Dwyer finds the book offers a convincing rebuke to the notion that the march of democracy is inevitable. Democracy in Retreat: The Revolt of the Middle Class and the Worldwide Decline of Representative Government. Joshua Kurlantzick. Yale University Press. March 2013. Published 21 years after Francis Fukuyama’s famous essay, The End of History and the Last Man, this book sets out to show, in contrast to Fukuyama’s triumphalist claims, that global democratisation is neither certain nor secure. Joshua Kurlantzick, a senior fellow at the Washington-based Council of Foreign Relations. has written an ambitious and timely book. Democracy in Retreat: The Revolt of the Middle Class and the Worldwide Decline of Representative Government seeks to explore the reversal of democratisation across the developing world, and to offer compelling explanations for this change in fortune for the political system. The two main areas of focus of the book, and this review, can be labelled as internal and external factors. The role of the title’s middle classes is the first major focus, while the influence, both positive and negative, of external state and non-state actors comprises the second. A key issue for any work that seeks to examine the fortunes of democracy concerns this concept’s very meaning. Kurlantzick draws on a widely used definition from the Economist Intelligence Unit: “[D]emocracy means ‘government based on majority rule and the consent of the governed, the existence of free and fair elections, the protection of minorities and respect for basic human rights. Democracy presupposes equality before the law, due process and political pluralism.’” Kurlantzick’s books also aims to add a component not included in this definition – democratic political culture – which includes “respect for the concept of a loyal opposition, support for democratic political institutions, and interest in and access to political participation, among other components” (p. 25). Such definitional questions are crucial, and as the book points out, the disputed meaning of democracy is a crucial fault line in the battle between Western democracies and more autocratic states which seek to promote ideals such as sovereignty and prosperity above political liberties. It is because the stakes are so high that it is disappointing that the book does not devote more time to elaborating its understanding of democracy; concepts such as due process and democratic politics culture are clearly contestable. The headline claim of the book is that the conventional wisdom which views a large middle class as a criterion for democratisation is becoming unsupportable. 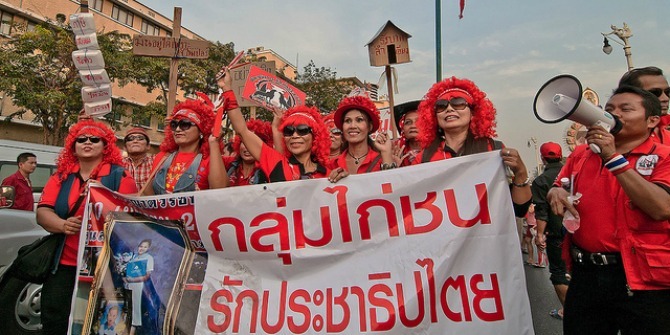 By examining protests movements in Thailand, the Philippines, and many other states, it is argued that where democracy leads to populist policies aimed at securing the votes of the poorer majority, the middle classes in these states exhibit no inherent commitment to democratic ideals. They mobilise to protest against elected leaders, often supporting or calling for military intervention, leading to instability and damage to the development of strong democratic structures. The author also notes, however, that the elected leaders in these states may themselves hold no commitment to democracy, and be better described as “elected autocrats”. This makes it difficult to conceptualise these conflicts as existing between pro- and anti- democratic forces. This is partly a result of the complexity of democratisation, but is a problem exacerbated by the opacity of the book’s definition of democracy. One key change which may explain why the middle class is no longer a solid friend to democracy is that in many of the “fourth wave” democracies being examined, the middle class – while sizeable – does not constitute a majority. This leads to democratically elected leaders choosing to prioritise the wishes of other groups, even at the expense of the middle class. It is these decisions that often build the resentment which leads to anti-democratic middle class protest movements. Outside of the domestic changes, the book explores another trend which is endangering the global march of democracy: that is, the existence of the “China Model”, or a “Beijing Consensus”, which offers an alternative to the democratic capitalist model. Kurlantzick argues that this model offers leaders in developing states the prospect of the growth levels associated with capitalism, without the relinquishing of control that would be required by democratisation. In the context of the global economic crisis, which left China relatively undamaged, and the governance crises of many developed democracies, China has begun to establish itself as a model to developing states. Through investment, diplomacy and cultural exchanges, this self-promotion marks a change from the Chinese policy of recent decades. Further, Kurlantzick argues that the War on Terror follows a similar logic as the Cold War, in that it enables Western powers, in particular the United States, to align themselves with non-democratic leaders in the interest of fighting the threat of terror. This, in combination with a reduction in the funding of democracy promotion by Western states has enabled the China Model to gain prominence in some states. While the book seems to prioritise the impact of the middle classes in developing states, it is this part of the book, focused on the geopolitical dynamics, which actually offers the most compelling analysis for the decline in the fortunes of global democracy. The key strength of this book is its breadth; it examines a wide range of developing states, and so offers a comprehensive view of the state of democracy worldwide. This is offset, however, by some lack of depth, both in terms of the definitional questions of democracy and in a deeper examination of the causation involved in this decline. While social scientists may find it somewhat descriptive, it will be useful reading for anyone seeking to gain an understanding of the “global democracy recession”. At the very least, the book offers a convincing rebuke to the notion that the march of democracy is inevitable, and should lead to more debates over the development of political systems.